SPINSTER STITCHER: FINISH ONE...START ONE! I enjoyed Harvest of Plenty so much that I decided to stick with Shepherd's Bush. 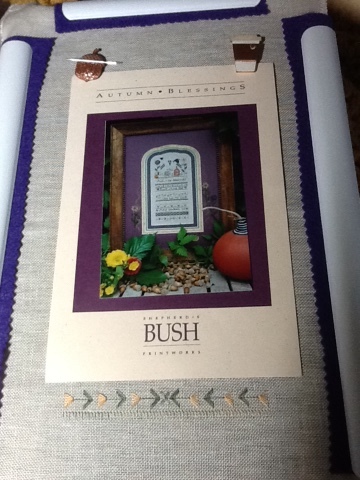 This is Autumn Blessings, and it's a lovely little band sampler done all in silk. Off to the chair in a moment, Dearies! I'm just getting that second cup of damn good in before I pack my bag. Happy Futzingday! Come tell me all about your neck of the woods! Shepherd's Bush has some really great designs. I look forward to seeing the finish on this one. Hope your session goes well. Their designs are so much fun! Coni you sound so energized! I think stitching really boosts your spirits. The cooler weather helps too, no? Have a good chair session! Looking forward to watching your progress on this one Coni. Pretty start! Hope your chair time went well!